We had fun making carrot bugs! This month’s crafty challenge was to make a fruit and/or vegetable stamping craft. We have never stamped with food before and I have to admit, it’s a bit addicting! It’s kind of like making your own homemade stamp. You can stamp with vegetables such as potatoes, celery, bell peppers, and more! 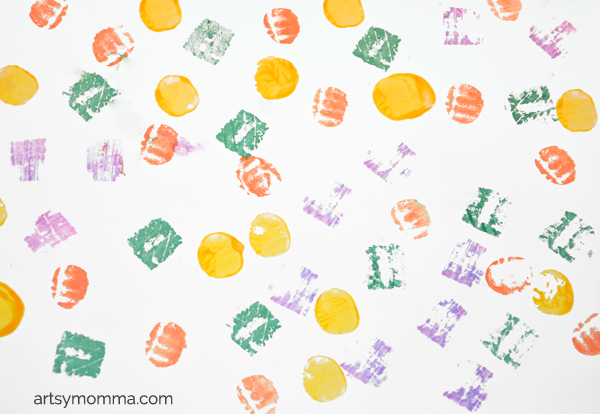 Lemons and oranges make pretty prints and apple stamping is popular during Fall. Add details to your homemade stamp by carving them, slicing lines, or poking it with something to make dots. 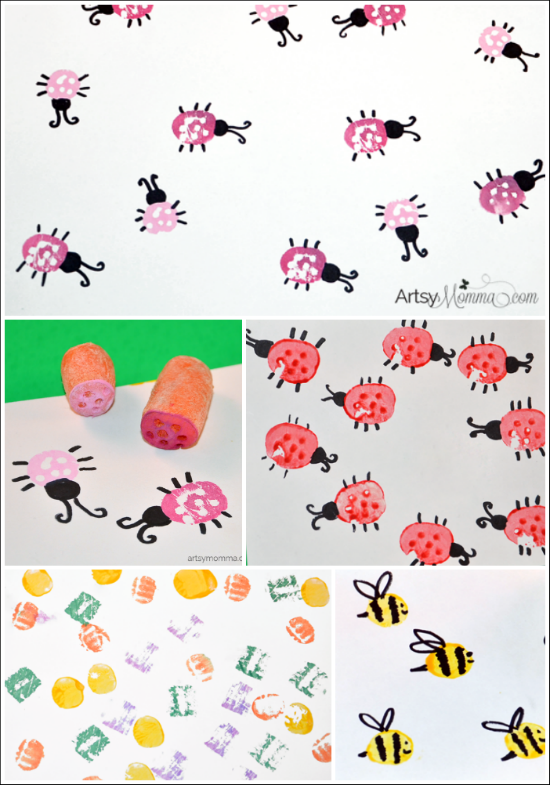 We did this with our baby carrots to turn them into ladybugs and with our onion prints (see the onion wall art here). 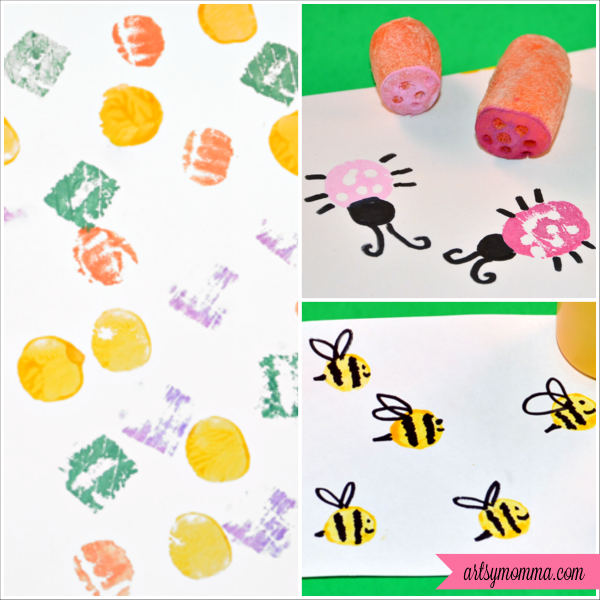 Before you throw out those end pieces/parts that go unused, consider letting the kids make prints with them. It’s fun! This would work with regular sized carrots as well as baby carrots. Cut the end off so you have a flat circle. If you accidentally cut on an angle, try redoing it with the same piece. 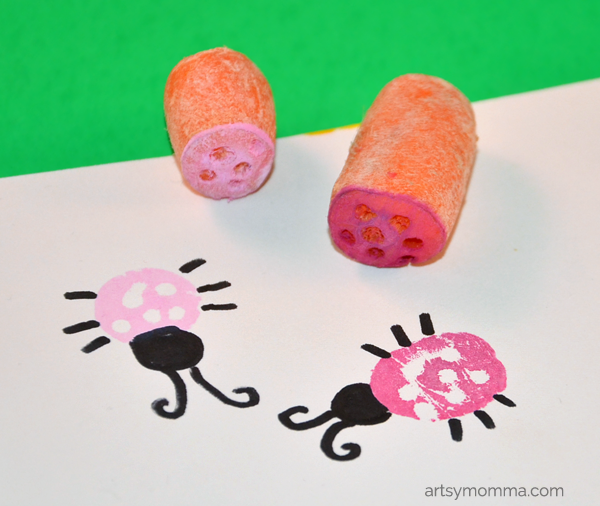 Find something you can poke the carrot with to make the ladybug’s spots. We used the end of a thin paintbrush. 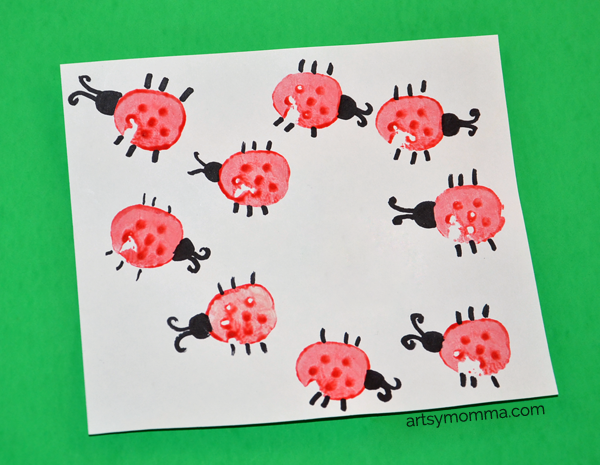 For stamping the ladybugs, we used ink pads. I thought it would show the dots better since with paint it can look smeared because of too much getting on it. Use a black marker to add on the head, antennae, and legs. 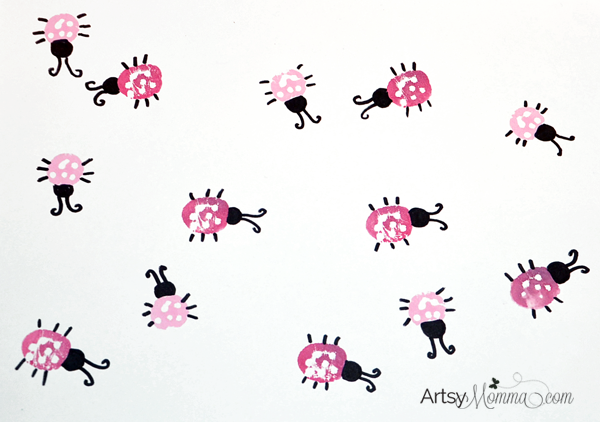 Little Sister loves ladybugs and is always drawing them. This gave her a new way to make them! We have it hanging up on the refrigerator. I love the Spring vibe it gives off to an otherwise dreary section of our home. 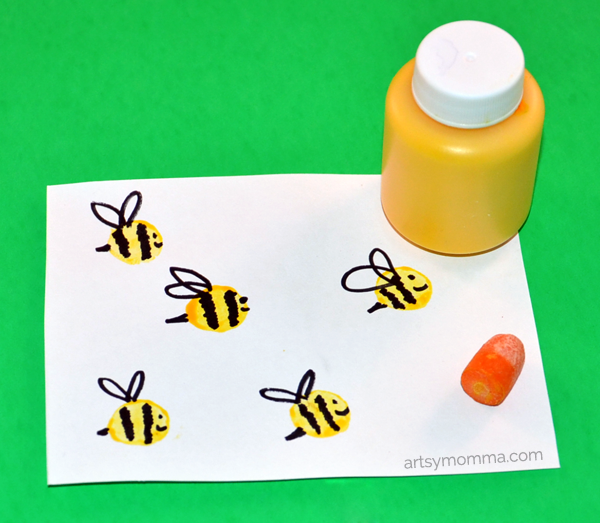 Here’s a cute bee craft we made before making the dots on the carrot for the ladybugs. Little Sister wanted to experiment with different colors so we made several carrot stamps. She used yellow paint to make circles. Then she tried orange from the ink pad which gave it a completely different look. The green and purple prints are made with a baby carrot I cut in half and then half again. I used a knife to cut diagonals on one and stripes on another one. She had a blast making prints all over the paper! This would be fun as wrapping paper or part of a card. 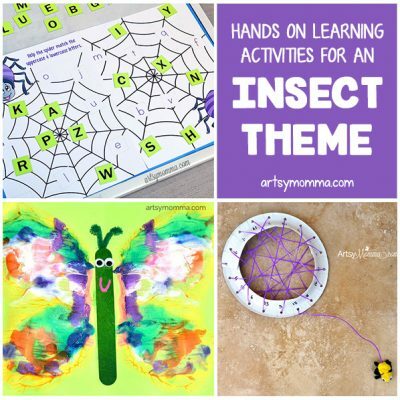 Follow along with our crafty challenges! Every month on the 18th will be a new challenge based on a common theme. See last month’s Disney-inspired challenge here. 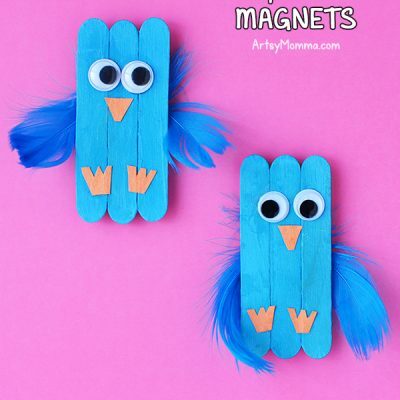 Follow all our posts over on the Kids Craft Stars Pinterest Board! What a simple but fantastic activity!!!!!! I love vegetable printing activities and can’t wait to try this out!!! !